Hi there. Wouldn’t you know it, I haven’t written in a while. It’s a thing. So Happy New Year to you and all that. 2014 has been interesting and different, both for society at large and me at small. I won’t dwell on the societal issues because those bring me down a bit. In personal terms, 2014 seems to have been good on average. I’ve ended the year in a better place than when I started, so I chalk that up in the win column. But I’ve been severely lacking in my game development and, most importantly, game finishing. So that has to change in the coming year(s). Over the past several years, I’ve thought a lot (and thought and thought and obsessed and analyzed and over-analyzed and thought) about motivation, positivity, negativity, and creative output. During this time, I’ve collected a lot of quotes and wisdom from various sources and compiled an ever-growing list of motivational quips that I’d like to share. They help me every now and then to keep perspective, and I hope you get something out of them as well. You are not in this world to live up to other people’s expectations, nor should you feel the world must live up to yours. – F Perl. And with that, here’s to a new trip around the sun filled with prosperity, peace, and progress for us all! As I’ve continued to work on Tiny Miner, I think we’ve finally come to the decision that the game is not very fun. There are probably some things we can do to change the gameplay around, but what was supposed to be a one-month game, and now two-month game, doesn’t feel any more engaging than it did in the first 2 weeks. That’s probably not a good sign. As developers like Spry Fox say, “Find the fun quickly“, and I don’t think I have this time. I think we should shelve it and move on to other projects. Which raises the question of where to go from here. Certainly I have pages and pages of ideas. We should be getting a Rift fairly soon, and that may sway my attention. 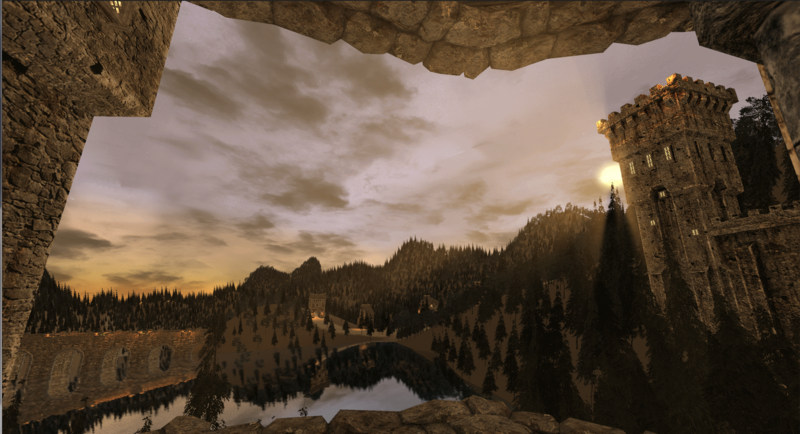 I haven’t done much 3D development, though, and I don’t have a solid idea for a game that would take advantage of the Rift in a novel, innovative way. Not yet, anyway. In addition, my day job is ramping up a bit as we finally start moving toward the end goal at the client site I’ve been working in since August. For the next 4 months or so, I’m probably going to be very busy. That might put a kink in my game devving time, but I haven’t been getting much done lately as it is, anyway. Optimism! Still, I’ll have at least one game project going on, even if it’s a small one. I just need to figure out what it will be. Currently, Tiff and I are playing Bioshock Infinite and Luigi’s Mansion 2 as well, and some inspiration may spring from those. I think for the next project, though, I might expand on the mechanic of Villagers Vs. Vampire and the world aesthetic of Tiny Miner. Exciting? Perhaps! I’ve also been getting caught up on all the discussions surrounding Pax East and GDC. I feel like a turning point has occurred in the past year or so with respect to ultra violence and lack of diversity in games, where developers and gamers alike have said “we’re tired of this stuff, we can do better” and good on them for it. Perhaps I’ll write a longer article about those things later. I apologize for taking so long to post any updates. It’s been a month since I started my current game project. How did I do? Well, progress was made, but not as much as I’d hoped or was shooting for. The goal was to create a shippable game in a month, partly inspired by Christer Kaitila (@McFunkypants) and his One Game a Month challenge, and partly from the desire to finish more games. The end result would be a game where I’m happy enough with the gameplay and the polish that I could actually put it out into the public and ask money for it. Then, I would add on additional features and polish going forward. Unfortunately, I didn’t get there in February. The main problem is that I didn’t stick to a consistent level of output throughout the month. I was doing fairly well the first 2 weeks, but later in the month I started slowing down considerably. I was distracting myself with my well-constructed creature comforts (watching movies and TV shows in the theater, playing a bunch of Fire Emblem: Awakening and Minecraft), and when you can only write games in your free time (outside of a regular 40-hour job), that time escapes you at an alarming rate. There are some days where I can only handle having one job, though, and those non-productive fun things help me decompress and not go completely nuts. 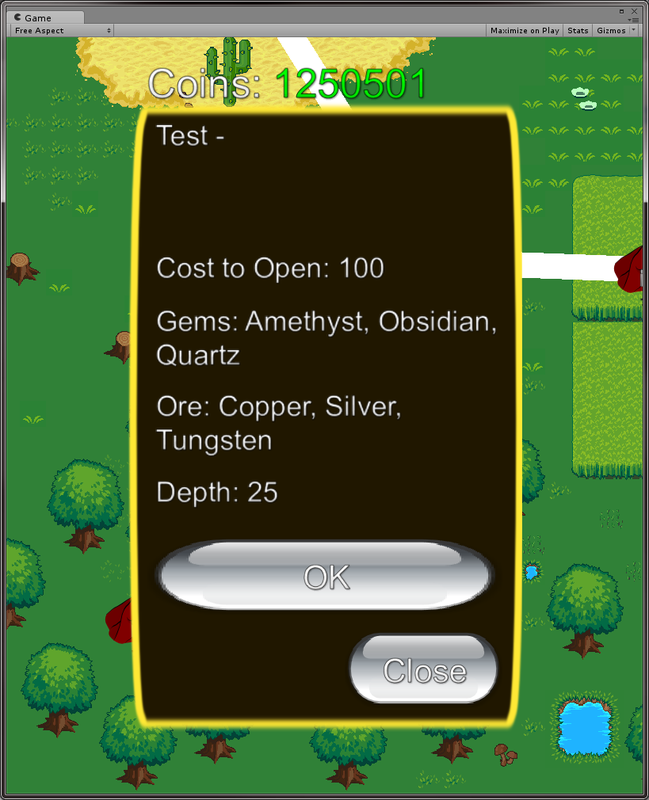 Each mine has a certain cost to open, types of ore and gems to be found, and a given depth. When the mine is opened, you then select a type of pick to take with you into the mine. You only get one pick, and each type has a certain number of uses. 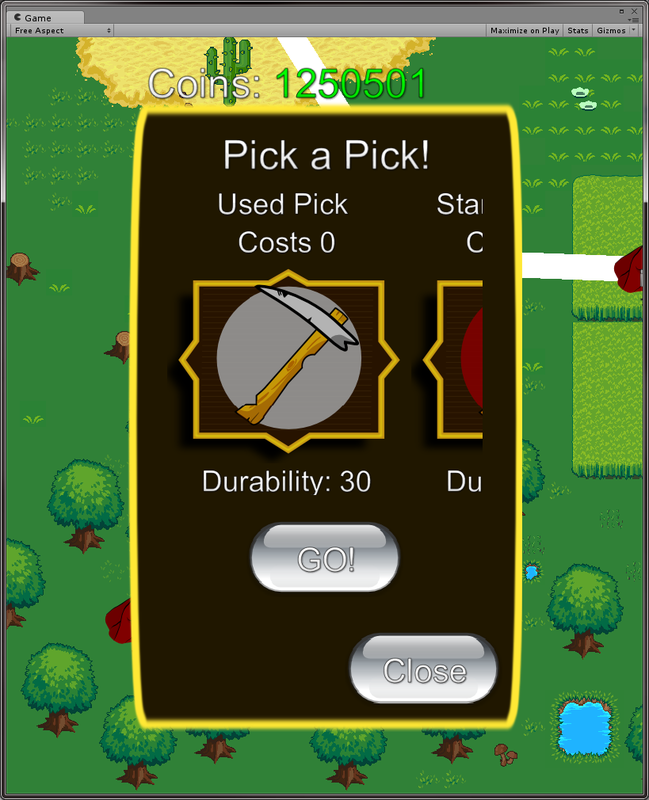 For the Used Pick, it only has enough durability to get to the bottom of the mine plus 5 more uses, so you have to be careful if you want to get out of the mine without needing to be rescued! On the plus side, a used pick doesn’t cost any coins. After that, you jump into the mine, and try to get to the exit at the bottom while picking up valuable ore and gems along the way. Again, I’m still in the “placeholder art” stage, so it doesn’t look pretty yet. But the game logic is mostly done at this point. The biggest feature I need to write at the moment is the one Tiffany came up with, where each mine actually has multiple shafts that you need to dig into. Each shaft completed will give you a star, and you can see the star rating of each mine on the map. It’s a sort of completionist guide, and I like the idea. 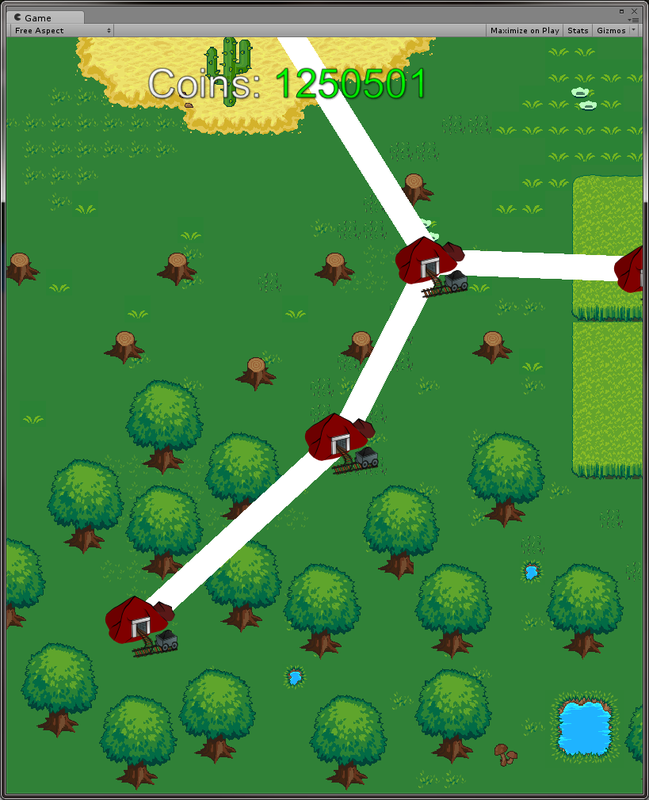 Plus, it will allow us to have more “mines” in the game without cluttering the map. So that’s my plan at the moment. Continue working on Tiny Miner until I have a Minimum Viable Product, put it out there on the various app stores (probably as a free title, with in-app payments, and no ads this time), then add features on a continuous basis. 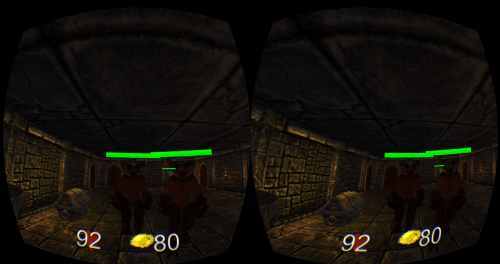 I have to admit, I’m also kinda chomping at the bit to start on some 3D proofs of concept, as the Oculus Rift and Ouya are being released very soon. But, I need to focus on finishing games first, otherwise there’s no point in having a game company if I don’t create revenue for it. At least I’m getting better at this sort of thing. Good day, peoples! I know it’s been some time since I’ve written, so here’s what’s going on. I’ve set a goal to write a shippable game in the month of February. It’s a puzzle-like mining game where you have to carefully plan your path before your pick breaks. 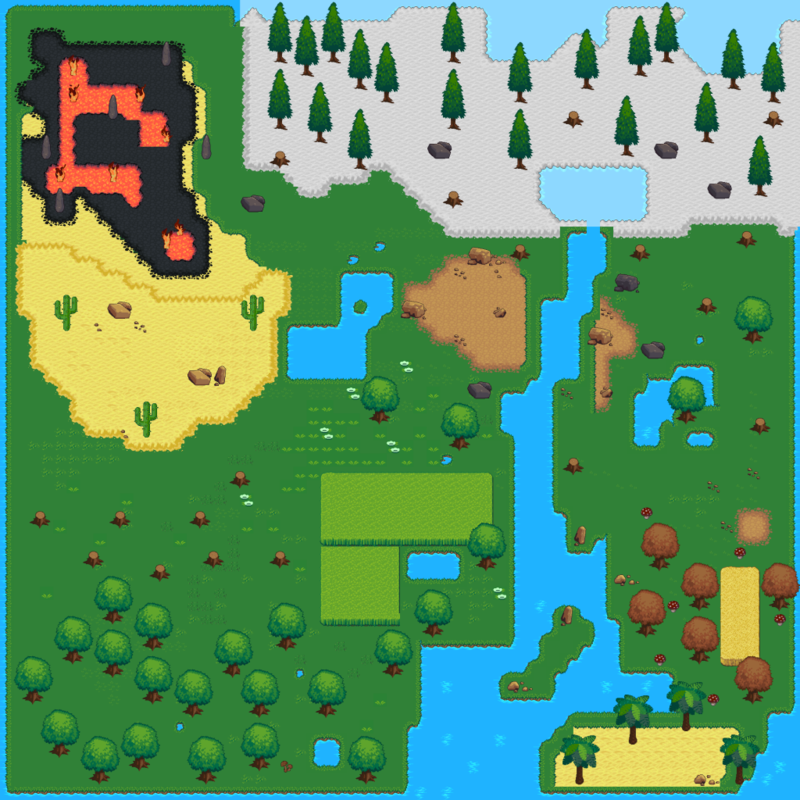 You take a tiny miner across a world map, opening mines to gather the ore and gems within. Each mine has an exit to find, and between each level you sell your loot, buy a new pick, and find more mines! That’s the plan anyway. We’ll see how it turns out. As of now, the game is somewhat playable, with a miner (white square) moving in 1 of 4 directions through dirt (brown) gathering gems (red) and ore (gold) while leaving a path behind (blue). 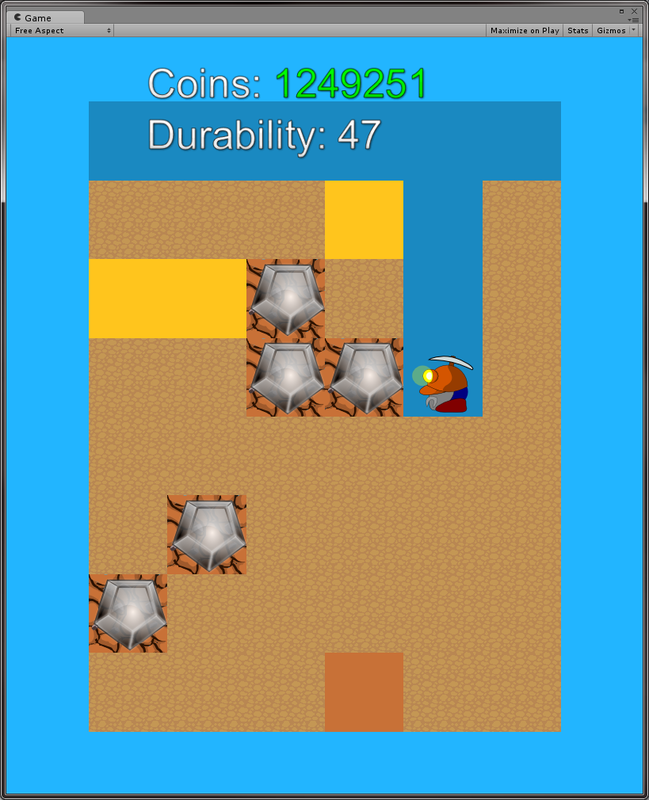 A Durability counter shows the remaining number of tiles that can be mined. 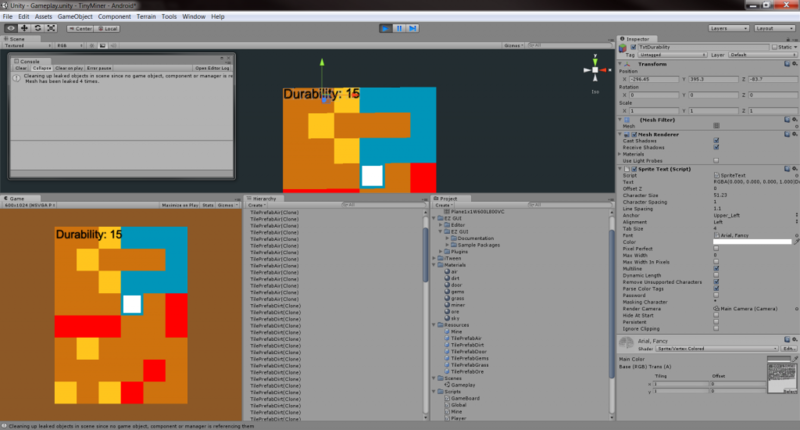 The graphics will look better than this eventually, I just have to get the game logic nailed down first. If you make it to the exit, you win and leave the mine. If you don’t make it before your pick breaks, you have to be rescued and will lose 10% of your accumulated worth as a rescue fee. Trying to keep it simple, straightforward, and most of all, fun. My first game took 9 months of my free time to write, but that also involved a lot of Unity education and game design research. So if I can get one done in 1/9th the time, I’m going to be fairly ecstatic. Even if I miss the deadline, it should be a great exercise and learning experience, and nothing prevents me from continuing development. I’ll try to keep adding more posts detailing my progress as I go along. Happy New Year everyone! Hope your 13 is even better than your 12. It’s been a while since my last post, so I felt like giving an update on things. I’ve been working on game prototypes the past few months, but haven’t settled on any particular idea to develop further. After releasing V Vs. V and the Halloween update, I’ve been a bit aimless. Somehow I’ve fallen into the common programmer trap that I avoided during my first game: starting a lot of projects that sound interesting, and dropping them when the work gets more involved. I suspect that my motivation has been affected by my day job, where I have greater pressure and workload than I did last year. But I can’t let that get to me if I want to publish more games. So here we are in the new year, and it’s a good time for gaining perspective and righting the course. I’ve started designs for a new game that may involve bubble popping, word creation, and mining, so we’ll see how that turns out. I’m also exercising again, to hopefully be more energetic and generally feel better. Despite my normal pessimism, 2012 was a great and exciting year for Tiffany and I, and 2013 is looking to be shiny as well. 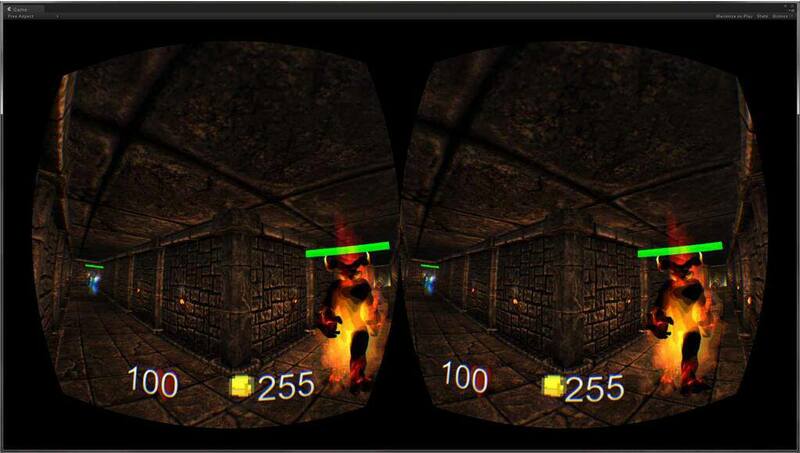 In addition to personal goals, we should also see mobile gaming expand even more, we’ll have the Ouya and the Oculus Rift to play with and develop for, more Kickstarters (I can’t tell you how many projects we’ve backed this year. Dozens! ), more indie interest and lots of great games to play. Best to you and yours, and happy gaming!